Outside their cemetery HQ, Leo, Don and Raph scope out the area surrounding the mausoleum for would-be spies who have been setting off Donnie’s alarms. Leo scouts around and finds the vandals: a pair of bunny rabbits. Relieved, the Turtles each decide to go back about their individual business. Raph heads back to the Foot HQ to continue training the recruits and to look into rumors that the Shredder’s Elite Guard may still be alive. Leo offers to come help, but Raph rejects him, as he insists that Leo’s presence would undermine his own authority among the Foot. Ego-bruised, Leo bids “Shredder” a farewell. Don says Raph gave him a similar speech earlier, then tells Leo he’s going to take the Triceraton aircar to Pittsburgh to pick up some equipment. Leo sees Donnie off and disappears into the sewers for some exercise. Unbeknownst to the Turtles, a group of spooks and a photographer, “Mr. Porter”, were spying on them from a distance. Believing the Turtles to be aliens, they call for backup. Down in the sewers this just isn’t Leo’s night, as he is suddenly hit in the side by a redneck’s shotgun blast. Leo hides in the shadows as the rednecks pass, looking for the “monster” so they can cash in its corpse for the reward. Leo hobbles to the nearest manhole and surfaces, only to be besieged by more rednecks with guns. Leo escapes into the shadows just barely in time. Weary but recovering from his ordeal, Splinter tells Leo that his brothers are free to find their own path. Leo begrudgingly concedes the point to his sensei and then discusses the “monster” issue. Apparently, a giant gator has been eating children in the sewers lately and one of the parents put a massive bounty on the creature’s head. Mikey reminds Leo that Leatherhead still lives in the sewer and he may very well be the culprit. Leo brushes by Casey and April, who are bringing Mike some celebratory pizza for his publishing deal, and heads off into the sewers alone to find Leatherhead. Following a trail of half-eaten rednecks, Leo finds a bloody message scrawled onto the wall: “I wating turtls”. Not much further from that, he spots the massive form of Leatherhead. Upon closer inspection, however, he discovers Leatherhead to be shackled from his claws to his jaws. Suddenly, what appears to be the fully-mutated Lord Komodo ambushes Leo, ready for vengeance, and sics his army of killer komodo dragons on the Turtle. *This story is continued from TMNT (Vol. 3) #16. The story continues in TMNT (Vol. 3) #18. 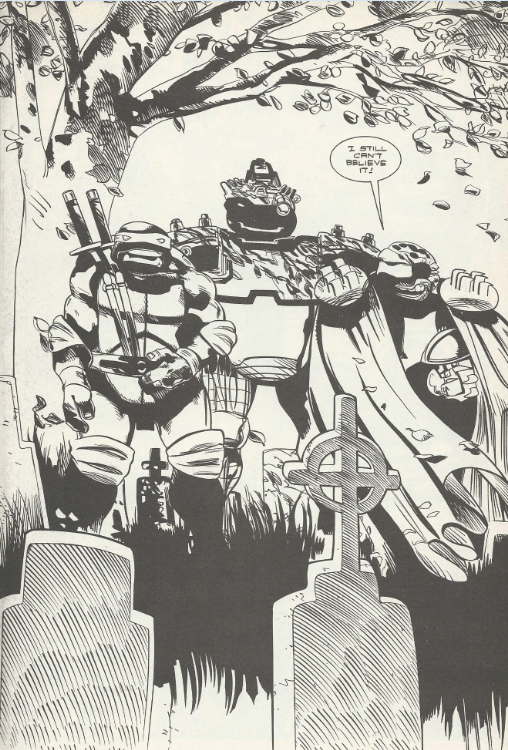 *Porter photographed the Turtles’ cemetery HQ in TMNT (Vol. 3) #12. 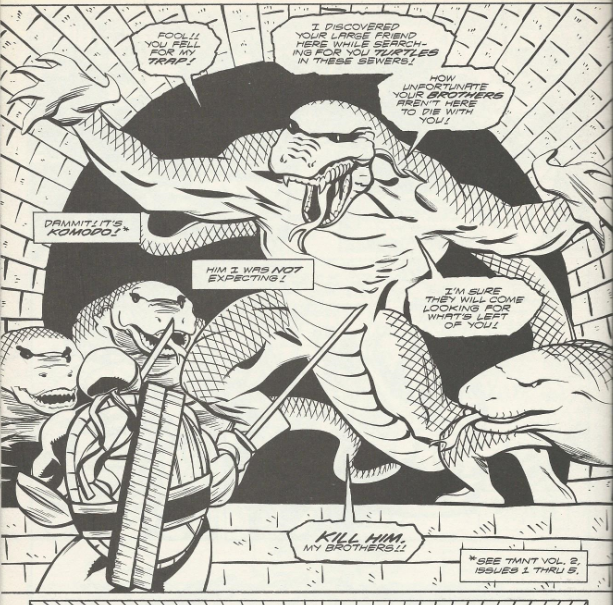 *At the time this issue was published, the Turtles last met Leatherhead in TMNT (Vol. 1) #45. 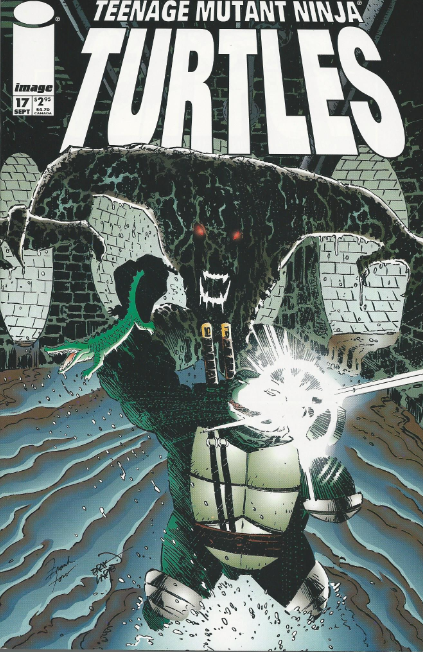 Several stories following up on TMNT #45 were written later, however, in Tales of the TMNT (Vol. 2). In regards to those, the Turtles last met Leatherhead in Tales of the TMNT (Vol. 2) #63. *During the description of Leatherhead's history, Carlson mistakenly describes the Utroms as having originated from another dimension, rather than another planet. *The Turtles last encountered Lord Komodo in TMNT (Vol. 3) #5. *The letters page reveals that Erik Larsen had plans to release a second trade paperback collection of TMNT (Vol. 3). Unfortunately, it never happened. If you ask me, I think that TMNT (Vol. 3) #17 is one of the best Leonardo stories ever written. “Leonardo leads”. We all know that. But beyond being leader, there really isn’t much of interest to the character. Being the leader of the Turtles is who and what he is. That’s why Leonardo trains the hardest. That’s why Leonardo forgoes all other luxuries such as hobbies and even a personality. Being “leader” means everything to him because that’s all he is and all he’s ever been. So what happens when the band breaks up and he’s no longer the leader of anything anymore? Though it doesn’t overtly dwell on that subject, that’s the primary tension on display in this story and it pulls off the excruciatingly difficult task of making Leo interesting. Raph’s off leading his own band of ninja and Leo isn’t invited to play. Don’s off doing science-y stuff in Pittsburgh and Leo wouldn’t really have anything to offer such a project. Mike’s secluded himself in writing the Great American Novel, building his career and basically going his own path that couldn’t be any further from ninjutsu... which is the one thing Leo knows. So what good is a leader if he has no one to lead? Watching Leo react to this very situation as it eats him up inside is fascinating, as he seems to be the only one in the issue who doesn’t notice that the problem lies with him, not his brothers. He transparently tries to horn in on Raph’s training of the Foot, which he finds himself summarily shot down from. He can’t relate to Don anymore, so he doesn’t even bother. He tries to bully Mike into abandoning his dreams for his own selfish goals and is put in his place by Splinter. By the end of this issue, Leonardo is PISSED and you can feel it in every panel and every line of dialogue. Everything he’s spent his whole life working for is falling apart and he doesn’t know what the Hell he’s going to do. And that’s just one element of the many things going on in this issue. Leatherhead returns and, at the time this issue was written, he hadn’t been seen in the Mirage universe comics for six years. Seeing him again was a pretty exciting moment at the time, especially considering this was only the third time he’d ever been featured in the Mirage series, too. Of course, much of the dialogue here presents some major discontinuity for those intent on placing the Image series back into Mirage chronology after it was surgically removed in 2001, but a clever reader can manufacture their own “Marvel No-Prizes” to work it back in. I’ll leave that up to you. Splinter’s alive and kickin’, if a bit slower than before. I was very pleased to see him shoot Leo down when he was bullying Mike, promptly encouraging his sons to follow their own dreams, whether they be the path of the ninja or not. 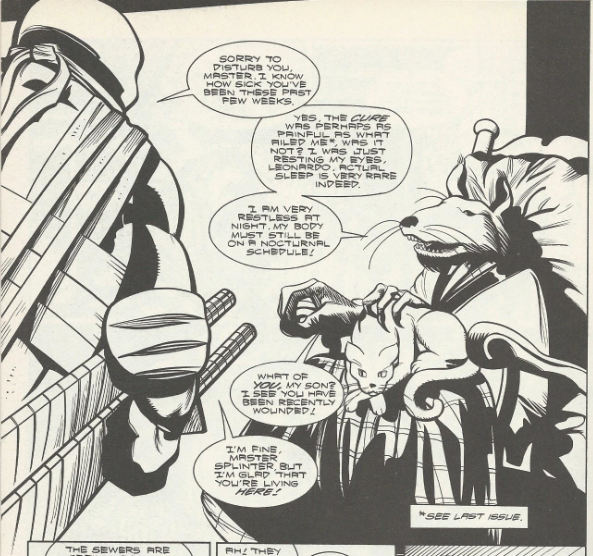 Splinter is their ninja sensei, yes, but he’s also their father and no good father would deny his children their dreams to further his own personal agenda. Moments like this, and the backup story “My Hero!” from Tales of the TMNT (Vol. 2) #25, really go a long way in showcasing the parental side of Splinter which is far too often overshadowed by his role as a ninja master. And even more still, Lord Komodo is back! Or is he? Odd that Leo would recognize him instantly in what would seem to be a fully-mutated state, considering he’d never seen him in such a form before. But then again, he’s a giant komodo dragon screaming about vengeance. Who else could he be? This is a very fascinating introspective issue that doesn’t come off as an introspective issue at all (it’s actually pretty action and horror oriented). Leonardo is a very difficult character to write for because his “Scott Summers-ness” makes him extremely bland, particularly when in solo stories. Carlson takes that aspect of his character and makes the uninteresting interesting. Color me impressed.